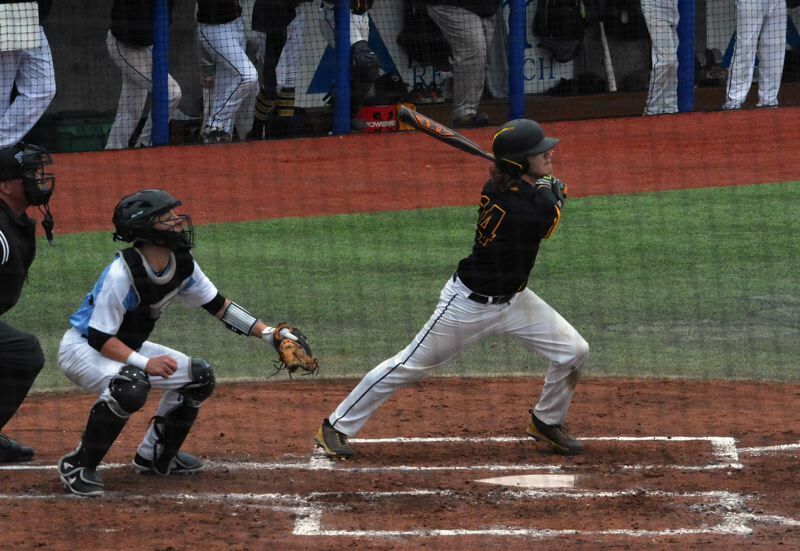 HILLSBORO — Facing a Class 6A opponent in Mountainside, in an unfamiliar, spacious ballpark at Ron Tonkin Field, the St. Helens baseball team put together its most complete game of the year. The defense was superb, and pitcher Kaleb Edwards was exceptional. The bottom of the batting order came through in timely fashion and helped build a 2-0 lead. 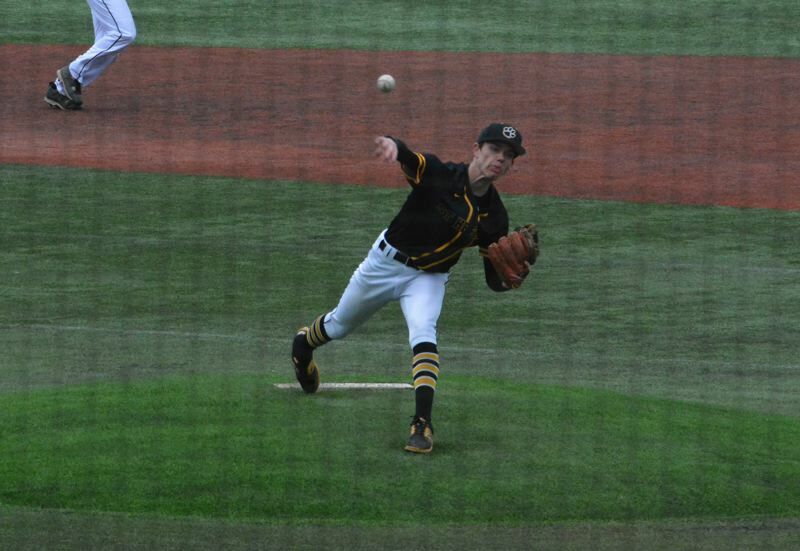 The Metro League Mavericks, however, came up clutch, scoring all three of their runs with two out, spoiling St. Helens' stellar showing with a 3-2 Glencoe Tournament win over the 5A foe on Monday. After a deflating, 11-1 nonleague loss to South Albany on March 21, though, nearly taking out a top-level team the next game was reason for optimism. "I was really excited and happy with the way we played," St. Helens coach Jeff Timmons said. "Defensively, that was our best game. (Edwards) threw really well, and I couldn't ask for anything better from him. I told our guys when (Edwards) throws a game like that we have to do a better job and get him a win. "That's the thing about being young, we're going to have games like this where it's like, 'Dang it'. But I think we performed really well. We bounced back." Of his 80 pitches, Edwards threw 53 strikes and walked just one hitter through six innings at the home of the Class A Northwest League Hillsboro Hops. The sophomore right-hander got ahead in the strike count with first-pitch strikes and forced Mountainside to press at the plate. "That was his best performance by far this year and our best performance on defense. It's just a bummer we didn't get the win," Timmons said. The bottom of the Lions' lineup was responsible for getting St. Helens on the board in the bottom of the second. Junior Jackson Hald reached second base on an error, and senior Justin Olson moved him to third with a single to center. Junior Jared Hora grounded to short for a force out at second but hustled down the line and beat the throw to first to score Hald and give St. Helens a 1-0 lead. Cody McKay, a sophomore, singled as well in the second to turn the order over. The top of the order, great through six games, was quiet against Mountainside. Yet, with the seventh, eighth and ninth hitters rounding into form, the lineup is looking much improved from a year ago. "It's exciting because we once we put it all together and all of us are going, we end up with those games with 18 runs and 15 hits like we did against Ridgeview," Timmons said. In the top of the third against Mountainside, Edwards reached on infield single, stole second, advanced to third on a fielder's choice and scored on a wild pitch with two out to extend the Lions' lead to 2-0. In the bottom of the fourth, with a runner on second, Mountainside's Logan Battles leveled an Edwards fastball to left center and looked destined for extra bases. But St. Helens senior center fielder Chris Beatty got a great read on the ball, raced over to the flight path and nabbed the shot on the run. Then, with Mountainside's Parker Rehm running on contact, Beatty stopped his own momentum in center and fired a one-hop throw to second for the highlight-worthy double play. Edwards got the next hitter to ground out to end the fourth. Mountainside scored twice in the fifth with two out. Edwards struck out the first batter of the inning, but an infield error allowed the next Maverick to reach base. Edwards struck out the next batter swinging for the second out. Then Mountainside's Yule Schrock slammed a hard-hit ball in the infield that was scooped up but thrown low and away to first, allowing Schrock to reach safely and Justin Hughes to score standing up for a 3-2 Mavericks lead. Timmons said St. Helens' bats went cold and into "coast mode" after scoring those two runs early. The Lions bagged six hits through the first two innings and two the rest of the way. "If we'd had a few timely hits, all of a sudden it's a 7-3 game and a little bit different story," Timmons said. "Mountainside got the timely hits, and we didn't. We had chances. We had opportunities. We had the bases loaded and first and third a couple of times. If we get a couple more runs early, I think we win that game going away." Still, that drought can be chalked up to youth as St. Helens has just three seniors. Mountainside, which opened for the 2017-18 school year, doesn't have a senior in its program yet. The combination made for a youthful nonleague contest with two squads trying to get their varsity sea legs. "It was like looking at ourselves in the mirror," Timmons said. "(Mountainside) is in the same exact boat. They're all juniors and sophomores. It was two identical teams fighting it out there. We did a lot of good things. They're a school of 2,000 (students) playing a school of 850. I liked the effort." St. Helens went on to play two more times in the Glencoe tourney. On Tuesday, the Lions dropped a 7-4 decision to 6A Liberty. On Wednesday, St. Helens finished its spring-break slate with a 5-2 loss to 6A Madison of the Portland Interscholastic League. The Lions outscored Madison 2-1 over the final five innings. Edwards had the team's only hit in that game; Beatty had an RBI. Starting pitcher Jacob Allen, a sophomore, went five innings, allowing only one earned run. Against Liberty, St. Helens matched the Falcons' nine hits but had four errors that led to a couple of unearned runs, and Liberty took advantage of eight walks. Allen, Hald and junior Garrett Harris all had two hits. Allen doubled. Hald, Harris and junior Drew Sullivan each had an RBI. The Lions will go into next week with a 1-7 overall record. They'll jump right into Northwest Oregon Conference action with three games against Putnam. The league opener is 5 p.m. Tuesday at Putnam. The one home game in the series with the Kingsmen will be at 5 p.m. Wednesday.